The EU May Abolish Daylight Saving Time Under a proposal, each EU member state would need to choose either "summertime" (daylight saving time) or "wintertime" (standard time). The change would go into effect in 2021. Members of the European Parliament have voted to abolish daylight saving time in the EU. 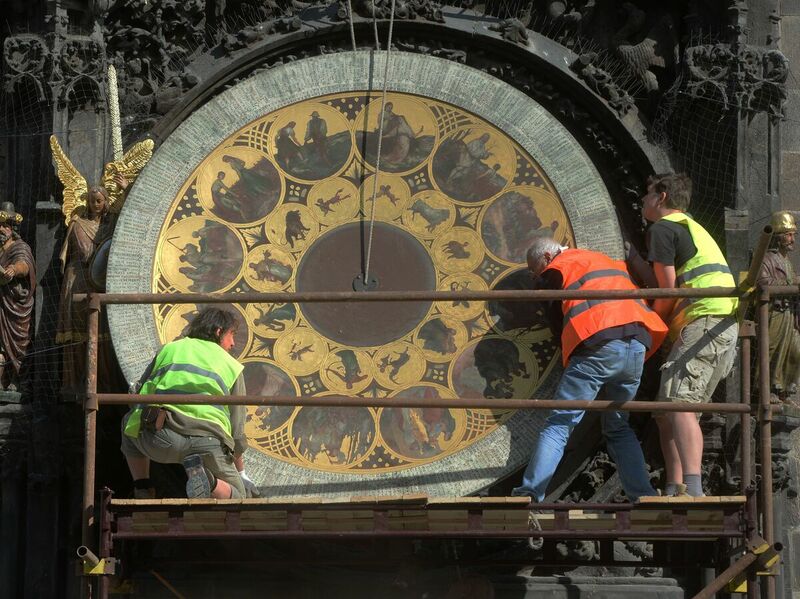 Here, workers remove the calendar dial of Prague's astronomical clock during a renovation of the building in 2017. Daylight saving time has been required in the EU since 2001. EU President Jean-Claude Juncker raised the issue in his 2018 State of the Union address. "There is no applause when EU law dictates that Europeans have to change the clocks twice a year," he said. "Clock-changing must stop. Member States should themselves decide whether their citizens live in summer- or wintertime." In a 2018 online public consultation, 84 percent of respondents in the EU said they wanted to abolish the time change. But as the BBC notes, 70 percent of the 4.6 million respondents in that survey were German, which apparently led to complaints that Germany was trying to foist its will on the rest of Europe. Only in Greece and Cyprus did a small majority of respondents prefer to keep the current system. In Finland, Poland, Spain and Lithuania, more than 90 percent of respondents were in favor of abolishing the time-change requirement. "Moving the clock one hour forward in spring leads to delayed sunset, until the clock is moved one hour back in autumn. This makes it possible to capitalise on natural daylight, and the practice is therefore also called daylight saving time (DST). Summer-time arrangements were first introduced during World War I by Germany and France, followed by their allies, for energy saving reasons, before being abandoned after the war. The arrangements were then revived in the 1970s in many European countries, in relation notably to the oil crisis and related energy-saving arguments." But the ideas that originally underpinned the resetting of clocks may not hold up, the EU found: the energy savings are marginal, the health and road safety impacts are inconclusive, and in agriculture, artificial lights and automation have lessened the importance of the time change. A number of the EU's neighbors and trading partners have already decided against a time change, including Iceland, China, Russia, Belarus and Turkey. If the proposal becomes law, any EU nation's choice of "summertime" or "wintertime" effectively means a choice of which time zone(s) it will reside in. In 2011, then-Russian President Dmitry Medvedev decided to move Russia to summertime. The BBC reports that while the change was initially popular, residents in northern Russia complained of winter mornings that stayed dark too long, and there were reports of an increase in morning car crashes. Russia rolled back the change and moved instead to permanent wintertime. In the United States, the debate goes on, seemingly forever. Most of the country observes daylight saving time, but Hawaii and most of Arizona do not. Florida wants it to last all year long: In 2018, its Legislature passed a bill that would make daylight saving time permanent in the state. But that's not allowed, according to the Uniform Time Act of 1966. Earlier this month, members of Florida's U.S. congressional delegation introduced the "Sunshine Protection Act," which would make daylight saving time permanent across the U.S. The bills have yet to be taken up in the House or Senate.